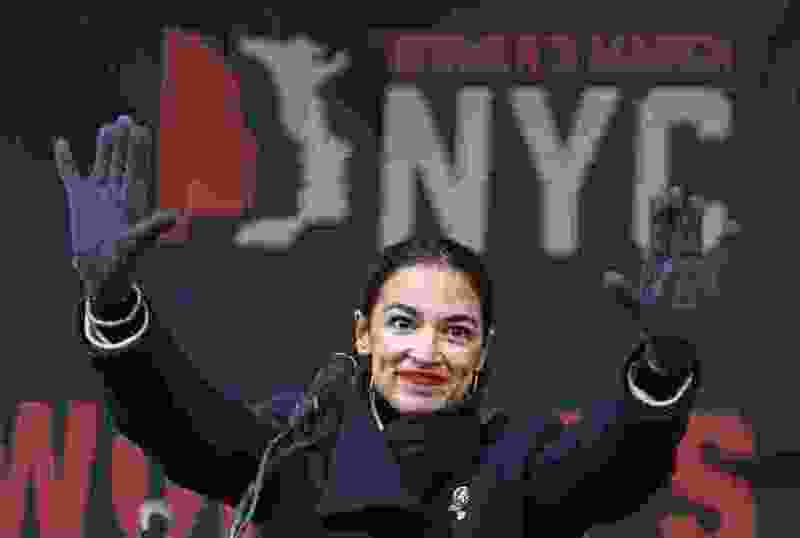 (Kathy Willens | AP file photo) In this Jan. 19, 2019, file photo, U.S. Rep. Alexandria Ocasio-Cortez, (D-New York) waves to the crowd after speaking at Women's Unity Rally in Lower Manhattan in New York. Democrats including Ocasio-Cortez of New York and veteran Sen. Ed Markey of Mass. are calling for a Green New Deal intended to transform the U.S. economy to combat climate change and create jobs in renewable energy. Washington • Democrats including Rep. Alexandria Ocasio-Cortez of New York are calling for a Green New Deal intended to transform the U.S. economy to combat climate change and create thousands of jobs in renewable energy. Pelosi said Thursday she hadn't seen the proposal but welcomes "the enthusiasm" of its backers.